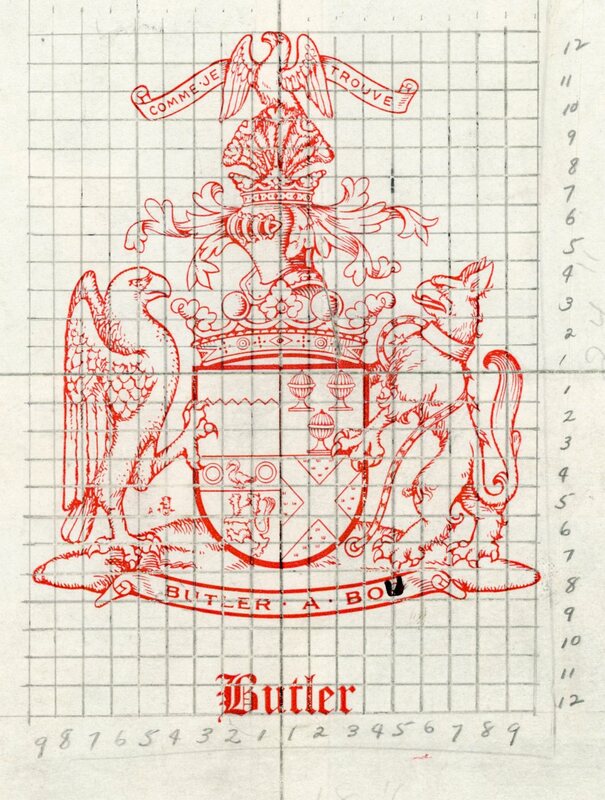 THEY MAY NOT have a family crest on their silver, but the Edward Butlers of 901 Fifth av S [Fargo, ND] have the Butler coat of arms in an embroidered wall hanging made by of Mrs. Butler. The design came from a book on the family's history and was enlarged by an artist friend and transferred to tailor's canvas for embroidering. A color chart helped Mrs. Butler choose the proper colors of thread. Among the symbols on the shield are bottles, since the first Butlers were bottlers to the king thus deriving their name; a cross for the crusades with a mark for ech time a member of the family went on a crusade; a gold portion for participation in the Battle of the Field of the Cloth of Gold, and a lion, for affiliation with Richard the Lion-hearted. 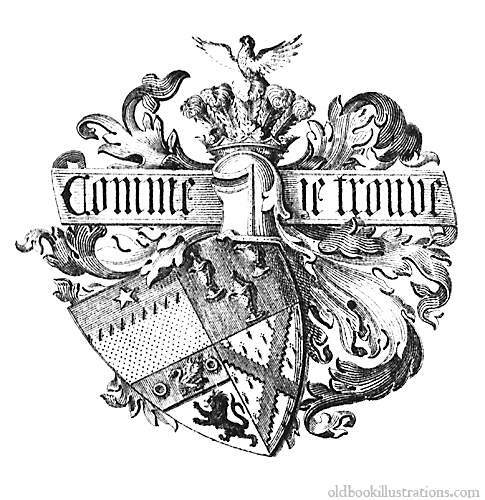 Also on the crest is the family motto, Comme je trouve, meaning As I Find It. Flanking the main part of the shield are a falcon and griffin, traditional heraldic characters. The hanging measures 24 by 36 inches and took Mrs. Butler two years spare time to complete. Our branch of the Butler family tree came to the U.S. with Nicholas Butler, circa 1636 (see Banks note)—leaving Ashford, Kent, England and settling in Egartown, Massachusetts. More genealogical data on the descendents of Nicholas Butler are available in our family tree. Out of a ducal coronet or, a plume of.five ostrich feathers, there from issuant a falcon, rising all argent. Dexter, a falcon, wings expanded argent, beaked and membered or; sinister, a male griffin argent, beaked, rayed, collared and chained gold or. Of all the shield and supporters, the element which characterizes specifically the Butler family is the shield; the rest are (symbolic) adornment. Sources (from left): Old Book Illustrations, Wikipedia (unofficially modelled on Kilkenny College's crest). The phrase "Butler-a-boo!" has long been associated with the Butler coat of arms--according to William Newton's A Display of Heraldry (pub. 1846). As Newton explains, the motto of the Fitzgerald family is "'Crom-a-boo!' --the ancient Irish war cry of the clan Fitzgerald;--Crom being the name of their castle, the cry may be translated 'Crom for ever!'" And thus perhaps "Butler-a-boo" is "Butler for ever!" There is an Irish word, Abú, which means "forever, long life," etc. Éire abú means "Ireland Forever"!!! (A kind of victory toast if you like.) Butler Abú means "Butler Forever"!!! The simple explanation of the phrase "Butler a boo!" is that it is the Irish (Gaelic) term a buadh, meaning "to victory!" Buadh, pronounced 'boo-a', is the Irish word for victory (it was a warcry, not a toast to the health of the clan). 'Butler' is a Norman French word meaning 'bottler', the butler being the member of the royal household responsible for the bottles in the wine cellar. Like the Stewarts in Scotland and the ShMgun in Japan, they rose to a position of great power in the court. 'Butler a bu' I translate as 'Butler has drunk'. I believe that the Duke of Ormond was first butler to the King in Ireland, or something of this sort. Perhaps in a ceremonial way, he would taste the king's wine first, to ascertain its quality and that it wasn't poisoned. If this is so, then 'the butler has drunk!' would be a sign that all is clear and everyone can relax. Assuming that he didn't fall down dead of course. I can also imagine that there might have been a few jokes about it all, then as now - 'Butler is drunk' being not so far different. 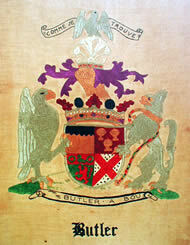 "Comme je trouve," a second phrase associated with the Butler coat of arms, translates from the French as "As I find." Perhaps the ancient Butlers were seekers (of truth?). 'Comme je trouve' I think means 'I take things as I find them'. I love this idea - that somehow we aspire to being realists, that we don't have to make things different to enjoy ourselves and find life good. 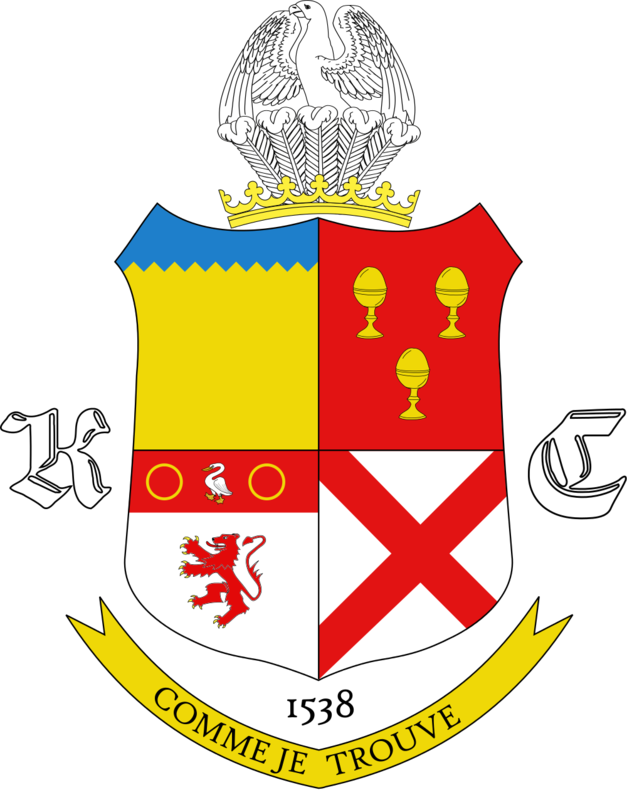 Kilkenny College, which was founded by the Butler family in 1538, uses "Comme je trouve" as its motto. They interpret it to mean "I take and make life as I find it" (Kilkenny). Each line describes one of the four quarters of the shield--beginning on the upper left side and moving right, then jumping to the bottom left and moving right again. One of the most confusing things about the blazon is that the colors ("tinctures") come after the objects ("charges") they describe and they all have their own heraldic names. In our blazon you'll find: Or (gold, usually represented by yellow), Gules (red), Azure (blue), Vert (green), and Ermine (stylized black ermine tails on white fur). For more on heraldory, see "Classical Heraldry." Seaver wrote numerous family histories, but there are doubts as to their authenticity. In fact, sometime in the 1930s, Horace J. Donnelly, solicitor of the Post Office Department at Washington, charged Seaver with plotting "a scheme for obtaining money through the mails by means of false and fraudulent promises." The method of obtaining subscribers for the genealogical books was to obtain through telephone directories or other means, a list of persons having ordinary names and to write these persons urging them to buy a book for $10 showing their descent from royalty or nobility. Exploits of bearers of the name were described in the letter, Mr. Donnelly said, and there was a similarity in the achievements of the ancestors, no matter what name was given them. The solicitor declared that a "Battle Hymn of the ______ Family" was included with each book, the name of the individual solicited being printed in the blank space. Charles E. Banks, "Sketches of the Early Settlers: Nicholas Butler," The History of Martha's Vineyard: Volume II Annals of Edgartown, history.vineyard.net/nickbutler.htm (local copy). Wikipedia contributors, "Butler dynasty," Wikipedia, The Free Encyclopedia, http://en.wikipedia.org/w/index.php?title=Butler_dynasty&oldid=597883687 (accessed March 16, 2014). "Classical Heraldry," Baronage Press and Pegasus Associates, 1999. www.baronage.co.uk/1999/herart01.html . "Genealogy Tracer Accused of Fraud," Chase Family Website, webnests.com/Chase/chronicles/genealogyfraud.htm . William Newton, A Display of Heraldry (London: William Pickering, 1846). J. Montgomery Seaver, Butler Family Records (American Historial-Genealogical Society, 2000 North Broad Street, Philadelphia). Reproduced on the Freer Genealogy Research Website.